On a wintry February evening, along a narrow road leading to a village nestled in the East Khasi Hills in India’s north-east, some children are playfully running around with branches of dry trees. Smoke hangs in the cold air. Around another winding turn on the road, a fire in the forest comes into sight. 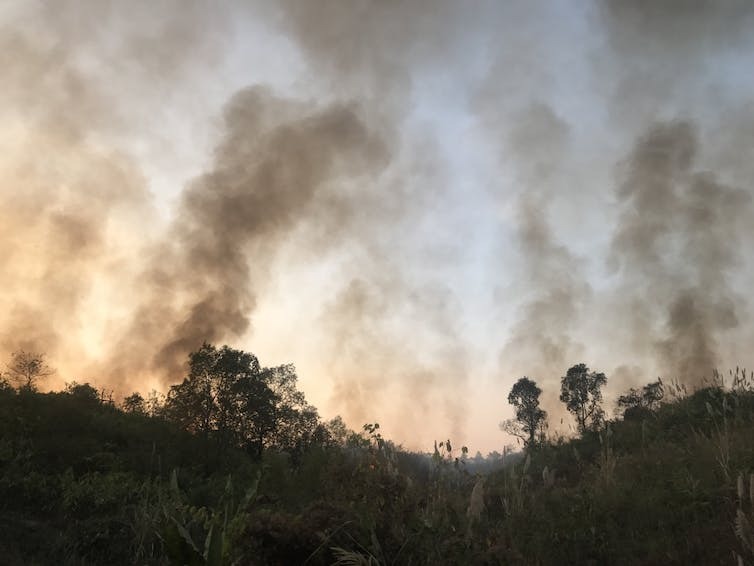 A local farmer is burning the undergrowth of the land he owns, employing the traditional slash-and-burn cultivation method. This method, also known as swidden agriculture, is referred to locally as jhum cultivation and has been prevalent across South and South-East Asia for centuries. Somewhere in the Khasi Hills, bordering Bangladesh, smoke envelops the forest. The children assigned with firefighting tasks, watch patiently as the fire spreads. As the fire reaches the edge, some try taking photographs with mobile phones. The children get on with their frantic brandishing task to prevent the fire from spreading further. The children manage to get into small nooks and corners to extinguish the fire. The day after, the forest land cleared and prepared for the next cropping cycle.